Political demonstrations erupted across Iran over the weekend, prompting some analysts to consider a domestic rejection of the Islamic Republic altogether. What would be the regional implications of a democratic or secular Iran? On December 30, 2017, protests erupted in major cities across Iran. What started as a result of economic pressures quickly evolved into a manifestation of political discontent, with chants calling for death to the president, Hassan Rouhani. A major theme in chants across the country was calling for an end to the billions in spending on foreign militias, particularly in Syria, Yemen, Iraq, and Lebanon, while Iranians suffer from an economic downturn and a 12% unemployment rate. Lack of government aid for victims of the recent earthquake near the Iraqi border has caused anger as the people continue to see billions more spent on foreign wars, including deployment of the Iranian Revolutionary Guard Corps in support of Syria's Assad regime. In addition to economic pressures, social and political dissatisfaction has grown over the years since the 1979 Revolution. Discontent with the strict Islamic laws is rampant, especially among the youth, who find little in common with the ruling clerical class. If anything can be learned from the region's tumultuous past, domestic pressures on the Islamic Republic's government could take on a revolutionary tone. If the Iranian people did rise up, remake their nation, and secularize their domestic and foreign policy, what would be the regional implications? Iran is undoubtedly a regional power within the Middle East. Its influence has grown considerably in recent years, particularly in Iraq, Syria, and Lebanon. Its heavy military spending is a point of contention for its neglected population, some of whom are without basic necessities. Iranian support for the Lebanese group Hezbollah has afforded the group a powerful position in Lebanese politics, making it not only a popular political party, but also a formidable fighting force. The militia is active in Lebanese territory, controlling major areas of Beirut as well as in the south of the country. Hezbollah's battles against Israel in the 2006 war garnered popularity among many segments of the Lebanese population. The group is now active militarily in Syria, supporting the Assad regime against rebel factions. But how much of this would be possible without Iranian support? Hezbollah is now well-established, and it could be self-sufficient entity after a potential Iranian withdrawal. However, it's more likely that it would lose considerable influence in Lebanon and in its international missions. Without Iranian military aid, Hezbollah would have difficulty maintaining the control it has gained in recent decades. In the event of a secularization of Iranian foreign policy, the larger geopolitical question would be in regards to the balance of power with Saudi Arabia. Without Iranian support, the current war in Yemen would likely turn to a Saudi strategic victory. A low-intensity insurgency would continue with the Houthi rebels, but Yemen would remain a Saudi-dominated region. Shia militias in Iraq would lose a source of funding and training, but they would not cease to exist. Iranian political withdrawal from Iraq would not likely improve the situation for Sunnis in the country, especially as the Shia militias continue to retake land previously held by ISIS. It's possible that a lack of Iranian influence could bring about a denouement to the sectarian tensions dominating Iraq over the last decade, but historical oppression of the Shia Arabs in Iraq is unlikely to be forgiven or forgotten now that they hold the upper hand. A dramatic change in Iranian foreign policy would cause a major shift in the regional balance of power. The recent rapprochement between Israel and Saudi Arabia would likely come to an end with the disappearance of their common enemy. A secular or democratic Iran would likely bring an end to worries about a nuclear program in that country. Reestablishment of friendly diplomatic relations between the United States and Iran would surely worry Saudi Arabia and its Gulf allies, although even a Saudi-Iranian rapprochement is conceivable in the unpredictable aftermath of a major shift in the balance of power. There are too many variables to predict the outcome of such a considerable deviation from the power politics dominating the region for nearly half a century. However, toppling the theocracy in Iran would have one almost certain outcome: Fears of a revolution would be reignited in monarchies across the region. Whether they would react by cracking down or liberalizing, another democratic regional power would dramatically change the order of the Middle East region. 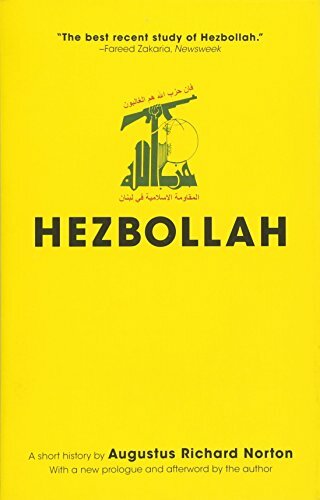 Today's book recommendation is Hezbollah by Augustus Richard Norton.